Why is the universe mostly matter? One of the basic assumptions of cosmology is that the universe is on average the same everywhere. That is, it is uniform and isotropic. This assumption seems to hold up quite well, but naturally there are studies done that look for violations of this assumption. Every now and then a research project will find what seems to be a violation of this assumption, but they generally don’t pan out when examined more closely. But there are aspects of the universe that aren’t symmetrical, and one of the biggest is known as matter/antimatter asymmetry (or baryon asymmetry). When we look at the universe around us, everything seems to be made up of matter. But from particle physics we know that every type of matter particle (proton, electron) has an antimatter sibling (anti-proton, positron) with an opposite charge among other things. We can make antimatter particles in the lab, but they always form paired with regular matter. For every positron we create, for example, an electron is also created. So when the very first matter in the universe appeared soon after the big bang, one would expect an equal amount of antimatter to also be produced. One would think the universe should be half matter and half antimatter, but it isn’t. There are lots of proposed solutions to this mystery, such as the idea that the early universe had small imbalances that were magnified by early cosmic inflation. In that way we just happen to live in a region of the Universe that’s dominated by matter. In other regions, far beyond the observable universe, there could be regions dominated by antimatter. But that idea isn’t very satisfying, so a more popular model is that some mechanism in the early universe must have made matter more common than antimatter. As strange as that seems, there is such a mechanism, and it’s known as CP violation. 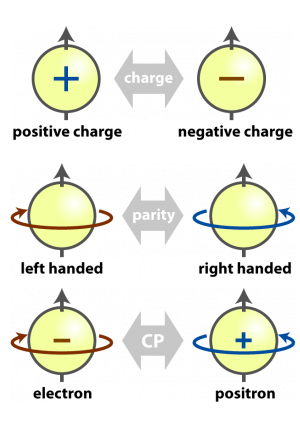 The CP in this case stands for charge parity, which are two symmetries in physics. 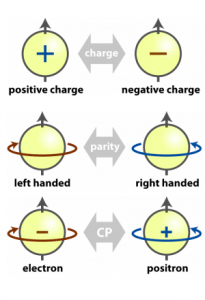 Here charge is simply the sign of the charge, thus electrons have a negative charge and positrons a positive one. Charge symmetry means that universe made of matter and one made of antimatter should behave in the same way. Parity can be described as a mirror image. If you hold up your right hand while looking in a mirror, your image will hold up its left hand. Typically parity is represented by spin, where one is right handed, and the other is left handed. Parity symmetry basically means that if left and right were flipped in the universe, nothing should change. If you combine these two symmetries you get CP symmetry. This means that if you flipped matter with antimatter and left with right everything should stay the same. It might seem pretty obvious that it shouldn’t make a difference if we called electrons positive and protons negative, any more than if we decided to switch the meaning of left and right. But it turns out that it isn’t so obvious for the universe. In 1964 it was found that a neutral particle known as a Kaon came in two types that were CP duals of each other. If CP symmetry were conserved, then these two types of Kaons should decay at the same rate. What we found was that the two Kaon types decay at slightly different rates. The difference between the two is only about 3 parts in 1000, but it isn’t zero. Fundamentally what this means is that nature distinguishes between matter and antimatter on a cosmic scale. They aren’t simply reversible. 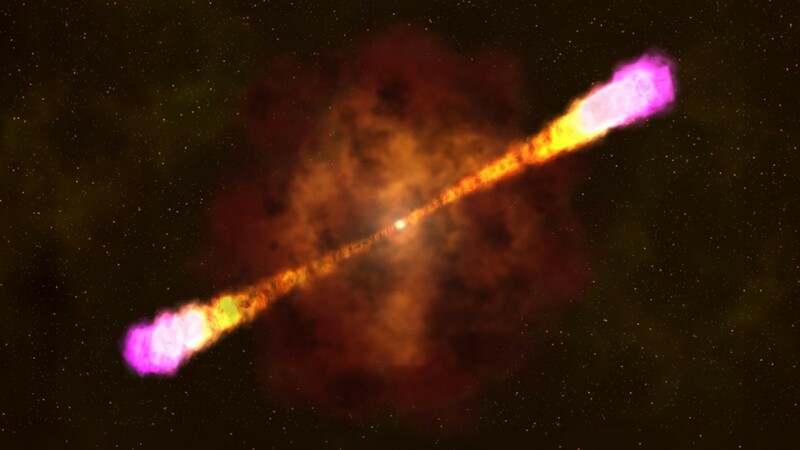 So it’s possible that the universe might have slightly favored matter over antimatter in the early universe. While we know that CP violation occurs, the known mechanisms by themselves aren’t enough to account for the matter/antimatter asymmetry seen in the universe. For the model to work, there must be some mechanism beyond the standard model that produces a large enough effect. It’s a mystery we still haven’t solved. At this point all we can do is keep researching, and see if the universe tips its hand. does time only come in one flavor or do the equations allow for and/or require “anti-time”? As far was we know, time just comes in the usual way. There are discussions about the arrow of time, but that’s a separate issue.